that extent our wrist and fingers. Tennis elbow is common in those who partake in activities requiring repetitive use of the wrist and hand. As the wrist bends and extends repetitively, the tendons pull and rub over the underlying bony structures, eventually this can cause microscopic tears within the tendons leading to a painful inflammatory response. Typically, tennis elbow pain comes and goes and people tent to ignore it. As you continue to exercise, the tendon integrity worsens and your pain may become present for longer periods during exercise until it is present all of the time. If gone untreated, tennis elbow will ultimately limit your activity performance. Management of tennis elbow may involve activity modification (such as sport technique alteration), massage, stretching and specific low level strengthening exercises. Also known as ‘student’s elbow’, olecranon bursitis refers to inflammation of a fluid fill sac (bursa) which sits between the point of the elbow (olecranon) and overlying skin. The bursa functions to reduce friction as structures rub over the bony elbow point. many office workers and students. Olecranon bursitis causes pain and swelling over the point of the elbow. The pain can be aggravated by resting on your elbows or by moving the elbow joint. 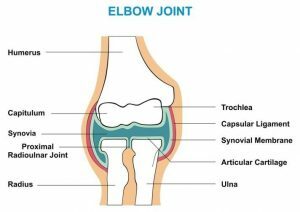 The swelling can cause the bursa to thicken and a small bump may be felt at the end of your elbow. As with most inflammatory disorders, rest is a wise course of action. The more the bursa is aggravated, the longer it will take to heal. A physiotherapist can assist in the management of this condition through activity modification, gentle exercises and inflammatory control.